After months of avoiding the living room on weekend mornings (paper doesn’t do much to block direct sunlight), we decided to take the plunge on a permanent solution. We could have put curtains above the window moulding but that would have blocked the window seat whenever we closed the curtains, which would not only cut our functional seating but also would make our room feel smaller. 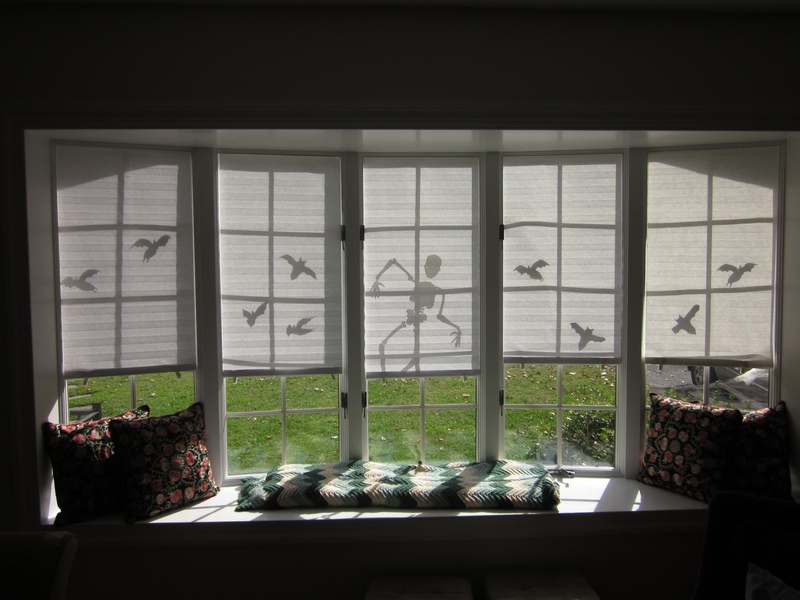 We contemplated getting curtain rods specific to bay windows or installing blinds. 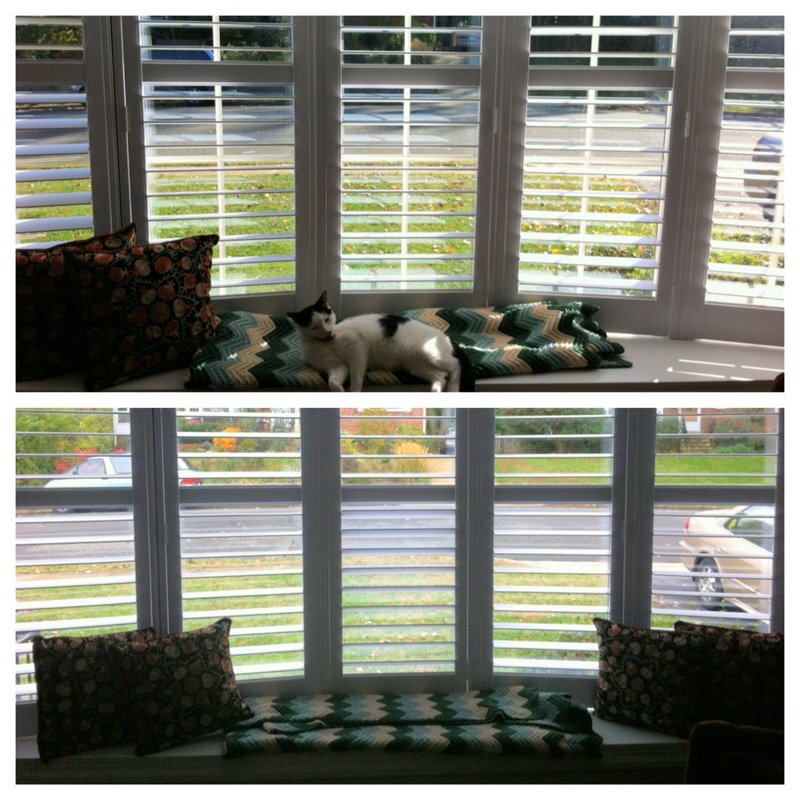 Ultimately, we decided that we loved the look of plantation shutters in bay windows. They are by far the priciest option but we hope to stay in our house long enough to make it worthwhile. We even justified it as our splurge for the year….which ended up being overshadowed but that is another story for another day. We got price estimates from two different companies and considered both vinyl and wood shutters. The company we chose charged the same price for vinyl and wood shutters. 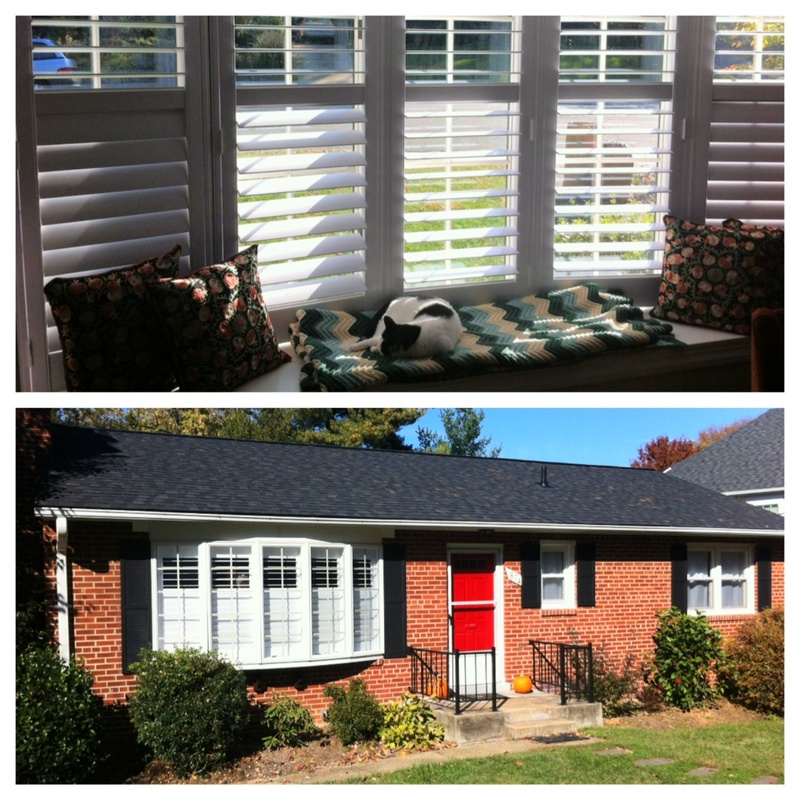 We floated the idea of only getting plantation shutters for the living room even though the original quote was for the living and dining room windows. They offered us 10% off the total quote if we did both rooms at once, and we signed on the dotted line. 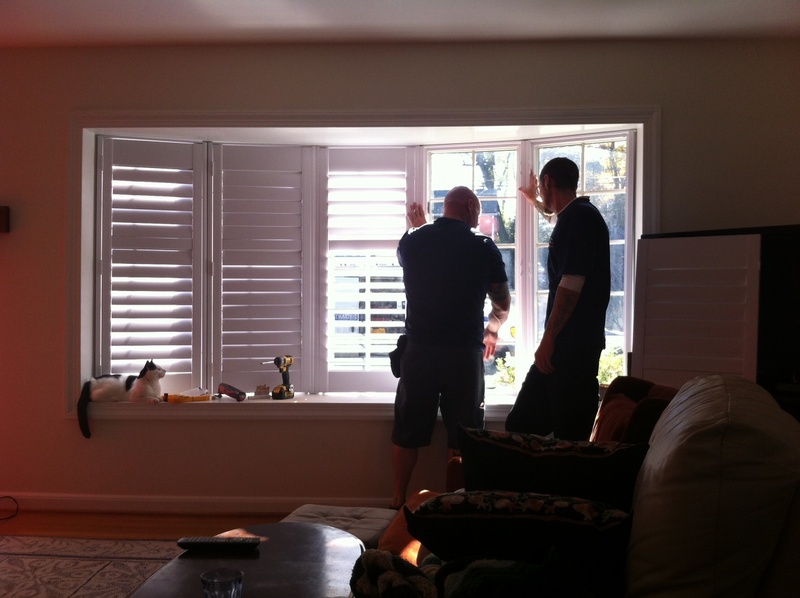 The shutters had to be custom ordered so it was several weeks before two gentelmen were able to come for installation. Of course Al wedged himself into the process as often as he could. 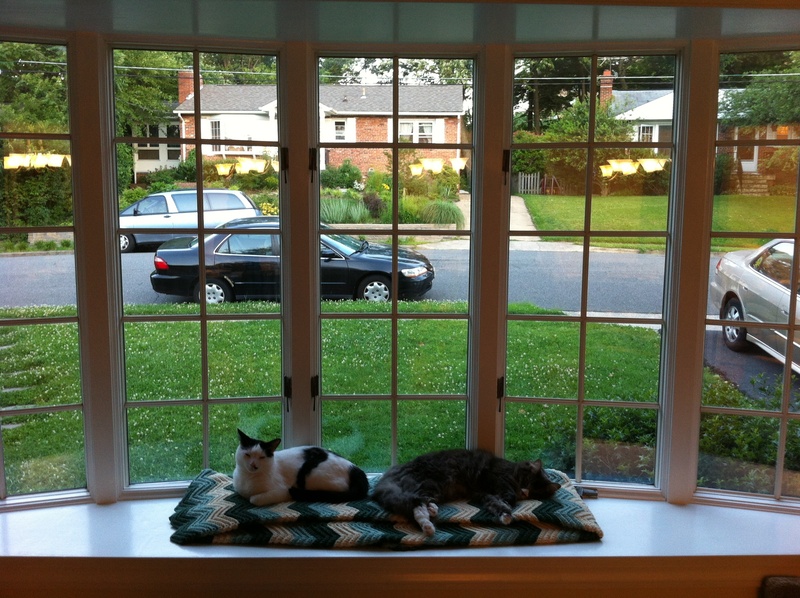 As the shutters were being installed, we learned that nothing about our bay window was plumb. Not even the window seat was flat. 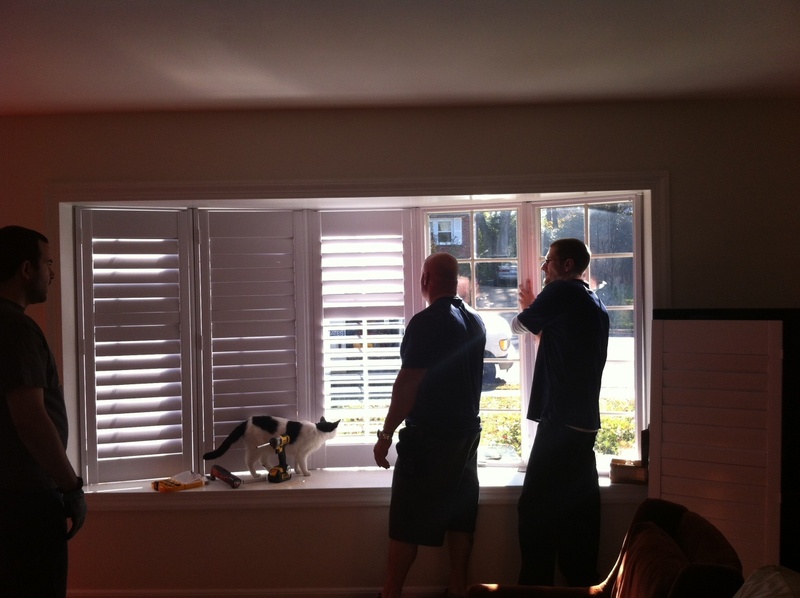 The guys who came to install ended up trimming and shaving each shutter so they would fit our wonky windows. Before we added the shutters three of the five window pannels could be opened. We didn’t make a habit of opening them because we didn’t like the way the screens obscured our view and an open window without screens would make our indoor cats outdoor cats. However, it is always nice to have options. We were bummed when we first found out that the shutter trimming and shifting would block our ability to open all but one of the windows. 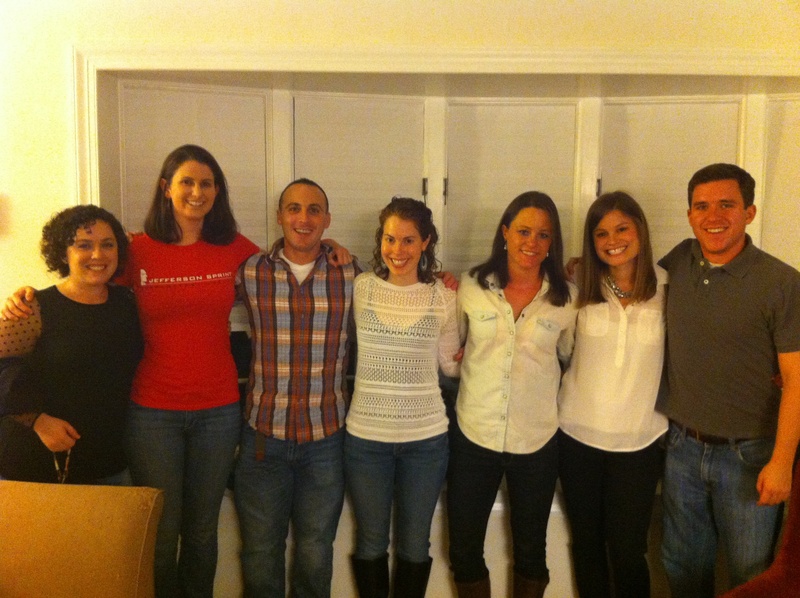 In the end we couldn’t stay mad at our beautiful shutters long. We ended up removing the white, plastic window grills. John never liked them. I thought they were a good architectural detail but along with the shutters they made the windows too busy. We have been living with our shutters for about five months now and haven’t yet felt the need to open our single functioning window. Regardless, it feels like a fare trade to be able to use our living room when the sun is out!